The battle over the Trans Mountain pipeline project is escalating, and Saskatchewan is ready to fully step into the fray. On Monday, the Alberta government introduced a bill that would limit exports of oil, natural gas and gasoline to British Columbia. The majority of gasoline used in B.C. is shipped through the existing Trans Mountain pipeline. B.C. 's government is opposing the expansion of the pipeline. Shortly after the Alberta government made its announcement, Premier Scott Moe said his government would be following with similar legislation. "We'll be introducing our own legislation in the next number of days not weeks but days and we'll be asking the opposition here in Saskatchewan to support that," Moe said. Moe did not give away any specifics but said it would involve putting in export permits on energy products going to British Columbia. "We hope it doesn't come to this, we truly don't. This is not a conversation we want to be having," Moe said. It is not clear whether Alberta's legislation would be in violation of trade agreements. Over the weekend, Prime Minister Trudeau met with B.C. Premier John Horgan and Alberta Premier Rachel Notley. There was no consensus formed but Trudeau said the project will go ahead and pledged to use the necessary financial and legislative actions to ensure it goes ahead. Notley has said the issue is not "too far off" a constitutional crisis. Moe would not go that far. "This is not a constitutional crisis, but this is a challenge for our country. The [constitution] clearly puts the responsibility for this type of a project in the federal government's domain and the federal government should exert their influence over this approved project." The Alberta and federal governments are in talks with Kinder Morgan on ways to give the company financial assurances the Trans Mountain pipeline project will go ahead. Saskatchewan will not be getting its wallet out, according to Moe. "Saskatchewan at this point in time is not looking at investing in this pipeline," Moe said. 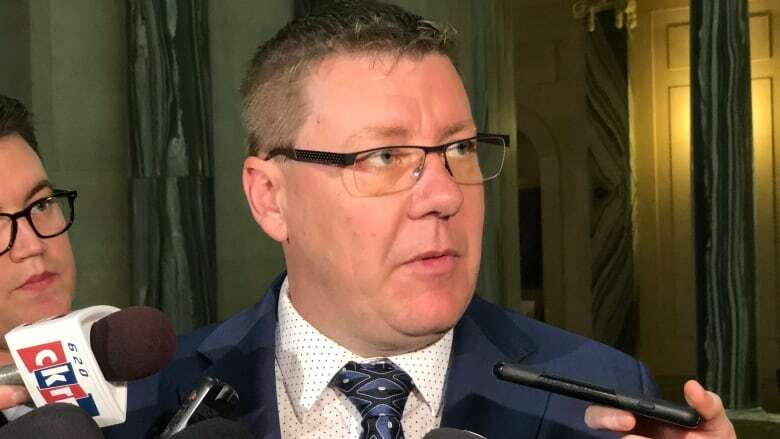 The premier said the federal government is imposing the carbon tax on Saskatchewan when it doesn't have jurisdiction but is not doing enough to get the Trans Mountain pipeline built even though it's a federal responsibility. NDP opposition leader Ryan Meili was pressed in question period on Monday as to whether he supported the pipeline. He said it was approved and should go ahead. But Meili was not as supportive when it came to restricting Saskatchewan's oil and gas exports to B.C. "I don't think at this time it's appropriate for us to be taking retaliatory measures. This is a federal issue and we should be demanding leadership from the federal government," Meili said. "This looks like him [Moe] trying to get into the story, and it's political posturing." 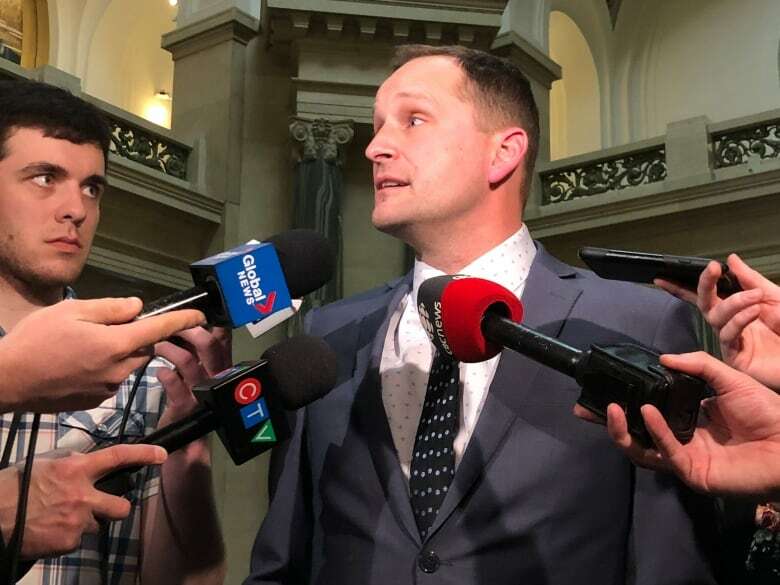 While the pipeline does not travel through Saskatchewan, Moe said the project has financial consequences for the province. The government said on Monday, in 2017 lack of access to international markets cost Saskatchewan's oil producers $2.6 billion. In addition, the province would have received another $210 million in taxes, royalties and other revenue. As for lost revenue to Saskatchewan if it restricted exports to B.C., the latest numbers from Statistics Canada shows Saskatchewan traded more than $350 million of refined petroleum products to B.C.